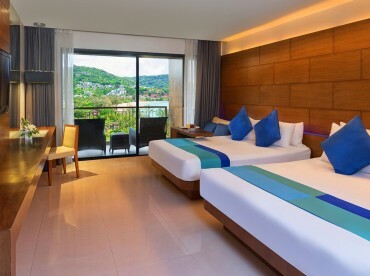 The feeling of pure comfort and relaxation fills Novotel Phuket Kata Avista’s selection of cool, quiet Superior Rooms with 1 King Bed. The hotel features 62 luxurious rooms in this class, each of them ideal for couples and travelers and offering more space (42.9 m2) than a standard hotel room. The private balcony allows natural light and beautiful views to complement the room’s soothing atmosphere. With each room being larger than the standard room with it’s spacious interior that includes a bathtub and sitting area, with carefully arranged decorations to provide a special welcome for all guests at this luxury resort in Phuket. With such comforts at one’s fingertips, the Superior Rooms offer a Phuket resort experience that’s hard to leave behind at the end of the holiday.